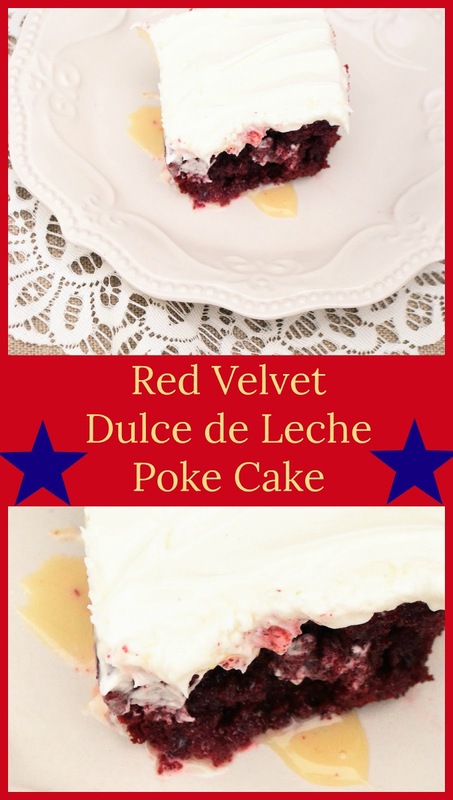 This wonderful sweetness is a great holiday dessert! This poke cake has the luscious moist red velvet cake, you love but bumped up a notch! It's got a hidden surprise inside! 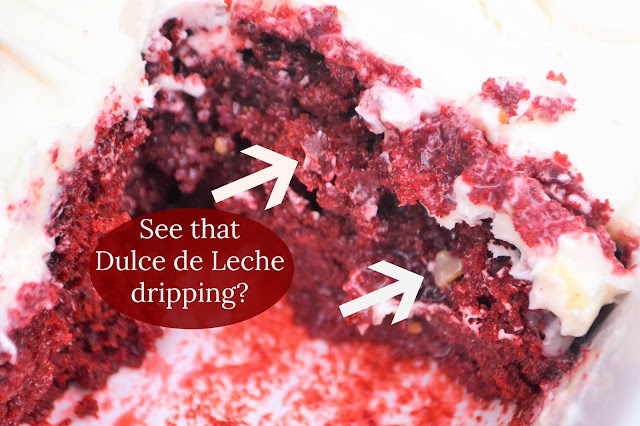 Just imagine the first bites of moist red velvet cake, then discovering the hidden drizzles of sweet dulce de leche just waiting for you! Topped off with a sweet buttercream frosting, this dessert is crowd pleaser for your holiday party! Jan's Tip's: You can substitute regular sweetened condensed milk for the dulce de leche milk, but I recommend making your own! It's easy and I'll show you how! Making your own Dulce de leche Milk: there are many methods on the internet, from using a slow cooker, to a double boiler, (don't even think about the microwave.. what a mess!) but here's my favorite.. the oven! Pour 1 can of sweetened condensed milk into a pie plate. Place pie plate into another larger pan with sides. Pour water into larger pan (about 4 cups) to surround pie pan in a water bath. Bake for 60-70 min. till thick and light caramel color. Stir / mix with a beater to blend. Prepare and bake cake mix according to package instructions. Remove from oven, and let cool.Using the handle of a wooden spoon, poke holes evenly throughout the cake.if using store bought dulce de leche milk, slightly heat up milk so it thins out and is pourable.Pour the dulce de leche milk onto the cake, into the holes of the cake, covering the entire cake.Frost the top of the cake with the buttercream frosting.